Like you, I like surprises. This book is a surprise for me because two years ago I got a book Georgia Freedman co-authored: There’s Always Room for Chocolate, the story of Brooklyn’s The Chocolate Room. Now I have Georgia’s new book: Cooking South of the Clouds, the food of Yunnan province in China. No, I had not a clue where Yunnan is. And how the heck does someone go from writing about chocolate in Brooklyn to spices in China? Yunnan is an out-of-the-way province in Southwest China on the border with Burma, about the size of California with an even larger population of almost 50 million. They largely live in mountain valleys. Which means there are mountains. Yunnan stretches up toward Tibet and one city in the province is the famed Shangri-La. That’s a magical name and, appropriately, this food is magical. In 2000, Georgia was a tourist in Yunnan and fell in love with its food. In 2011, she and her husband Josh quit their jobs, found carriers for their two cats, and moved to Yunnan. This book is her personal, quite comprehensive research survey of the foods to be found there. Georgia explains there is no “single Yunnan” cuisine. The area is too large, the terroirs too diverse, and over 20 different minority cultural groups inhabit the cities, villages and farming valleys. Because Yunnan is not yet a major tourist hub, Georgia has explored the food of the common man [and woman]. There are the recipes of the locals across the province. 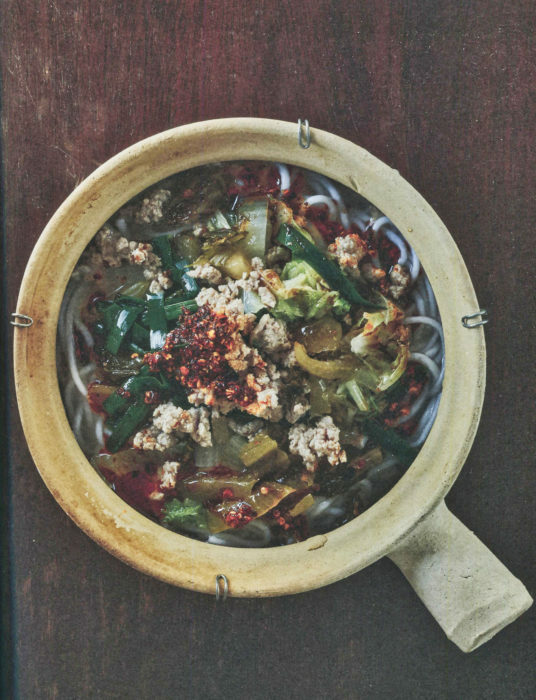 Foods here reflect generations of evolution and perfection, dishes like this Clay Pot Noddle Soup from Kumming, the capital city of the province. Ever hear of Kumming before? I’m embarrassed to say I had not. It’s a small town, only 7 million people. That’s the exciting thing about Yunnan, really all of China: there are surprises and some of them are very large. This particular noodle soup is classic: chopped pork, pork broth, sliced cabbage, mustard greens, noodles, chives, chile oil, and vinegar. You know that this soup will be supercharged with a spectrum of flavors. And just a smattering of heat. To be truthful, few of us cook Chinese at home in America. Of course, if we are lucky enough to have a Chinese mother or grandmother, that’s a boost. But a boost that most of us lack. This book, filled with recipes and stories about the food and people and land, is just the kind boost we need to tackle this cuisine. The dishes here are often quite exceptional in their ingredients, flavors, and ultimate taste in our mouths. They may be different but they are delicious. And Georgia has done a superior job of presented them to us in recipes that we can understand, follow, and happily conqueror in our home kitchens. 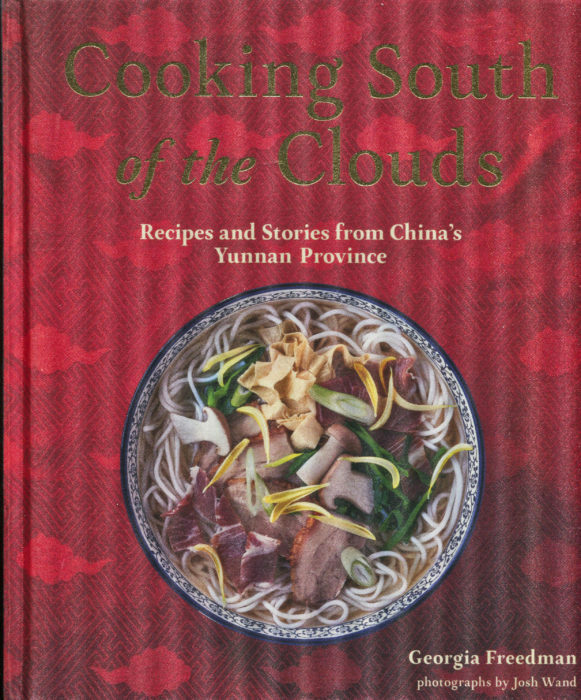 If you want to start cooking Chinese, then Cooking South of the Clouds will transport you with flair and flavor.